Book Review: 'A Gathering Of Shadows' By V.E. Schwab V.E. Schwab's follow-up to A Darker Shade of Magic picks up with heroes Kell and Delilah adventuring (and sometimes agonizing) in a magical alternate London while danger lurks in the titular shadows. The title of this followup to V.E. Schwab's 2015 fantasy novel A Darker Shade Of Magic might be considered a warning for impatient readers: In A Gathering Of Shadows, plenty of shadows gather. Portents simmer. Tension mounts. Disaster looms. Evil threatens. But nothing much comes of any of it until the final pages, which dash to an intense cliffhanger ending. Schwab — who also publishes young-adult books as Victoria Schwab — centered Darker Shade Of Magic on two characters. Kell is one of the last of the innately magical people called the Antari, and one of the few capable of traveling between the four different extraplanar versions of London. 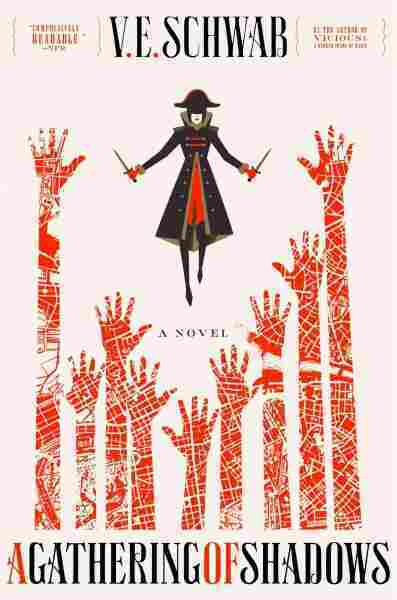 Delilah Bard is an endlessly ambitious thief who's escaped from magic-free Grey London into Kell's Red London. While they periodically pine for each other in Shadows, they spend most of the book apart, as he returns to his frustrating life as a pawn of the Red London crown, while she signs onto a privateer ship and starts exploring magic. Where Darker Shade Of Magic focused on world-building, the sequel focuses on character-building. Kell is trapped by his emotional and magical bonds to Red London's royal family, but his sense of duty and his longing for freedom are in constant stressful conflict. Delilah has all the freedom he lacks, but none of the connection. As she recklessly tests the limits of her expanding powers, her choices sometimes push past "amoral hero," and well into sociopathy: She murders one man in this book largely for sexually harassing her, and another for coming after her when she steals his purse on a whim. Her selfish confidence is refreshingly different, but it can be repellent when it visibly ruins other people's lives. Periodically, Schwab teases a threat brewing in one of the other worlds, emerging from choices Kell and Delilah made in the last book. But mostly, she follows her characters on ill-fated bar-hopping sprees and adventures at sea, through fights and conversations that feel like fights, and especially through their mental travails as they question their place in the world. Eventually, the book focuses on the Essen Tasch, a magical competition that strongly recalls Harry Potter's Triwizard Tournament, if the combatants were all drawn from Avatar: The Last Airbender. Kell and Delilah are both determined to compete in the contest, which draws elemental magicians from three countries to compete in matches where they hurl fire, water, earth, and so forth at each other — and after hundreds of pages of understated yearning, they finally seem destined to meet again. It frankly feels subversive to have the male lead struggling with the way his compassion and caring leave him helplessly constrained, while the female lead defiantly takes on the world, adventuring with minimal reservations or guilt, and leaving a trail of wreckage in her wake. The stakes in this sequel are mostly smaller than in the series' opener, and Schwab sometimes tries too hard for big, dramatic horror — she repeatedly gives her characters lavishly described nightmares in place of actual conflict. But the book is still filled with incident and emotion, with difficulty and heartbreak and anger. And it frankly feels subversive to have the male lead struggling with the way his compassion and caring leave him helplessly constrained, while the female lead defiantly takes on the world, adventuring with minimal reservations or guilt, and leaving a trail of wreckage in her wake. These are figures who barely need a villain to bring their strengths and weaknesses to light: They do a fine job of that themselves. That said, the villain lurking behind the scenes in this book is engrossing, largely because Schwab complicates his intentions and their outcomes to the point where the next book clearly won't be a simple good-vs-evil throwdown. He's a sort of anti-villain, as tormented and compromised as any anti-hero, and considerably more well-intentioned. It's frustrating that after 500 pages, the book ends just as that antagonist finally shows his hand. But A Gathering Of Shadows is still a lively, quick-moving fantasy that makes sure fans will know its characters well enough to care when, at long last, that otherworldly threat comes for them. Tasha Robinson is The Verge's film critic, and a former Senior Editor at The Dissolve.